picked up books one and three of Irene Hannon's Heroes of Quantico series at my local library book sale. The first book (Against All Odds) was good, but included a lot of telling rather than showing, so I put off reading book three (In Harm's Way.) A few weeks later looking for something to read, I decided to give Irene another try. Am I glad I did. The novel is about music teacher Rachel Sutton and FBI Special Agent Nick Bradley who were both foster kids (for different reasons). After work one day Rachel finds a discarded Raggedy Ann doll and when she picks it up, she experiences a panic attack. Despite the negative vibes she gets from the doll, she feels she needs to do something about it. When the local police are disinterested in what she has to say, she turns to the FBI, and Nick is the one chosen to take her statement. His first instinct is to write her off as another nut-case, but he is intrigued by her demeanor and decides to pursue the case. 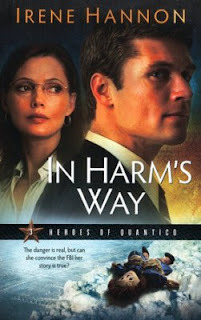 In Harm's Way is well-written and well-researched. It is obvious Ms. Hannon spoke with subject matter experts to get the technical parts of the novel correct. I learned a lot about several things (won't say what because that would include a spoiler) without feeling like she was hammering me over the head with the information. It is mostly passed along through dialogue. The book was fast paced and I stayed up late a couple of nights to finish it. Highly recommended! I picked up this book and the first in the series (Against All Odds) at a library book sale. The first book was good, but included a lot of telling rather than showing. Because of how I felt about Against All Odds, I almost didn't read In Harm's Way. I'm glad I did.